Don't worry if you're not feeling the love this year! Fire Label has you covered with this Survival Kit! It contains everything you need including a £20 Pizza Hut Voucher just for you! 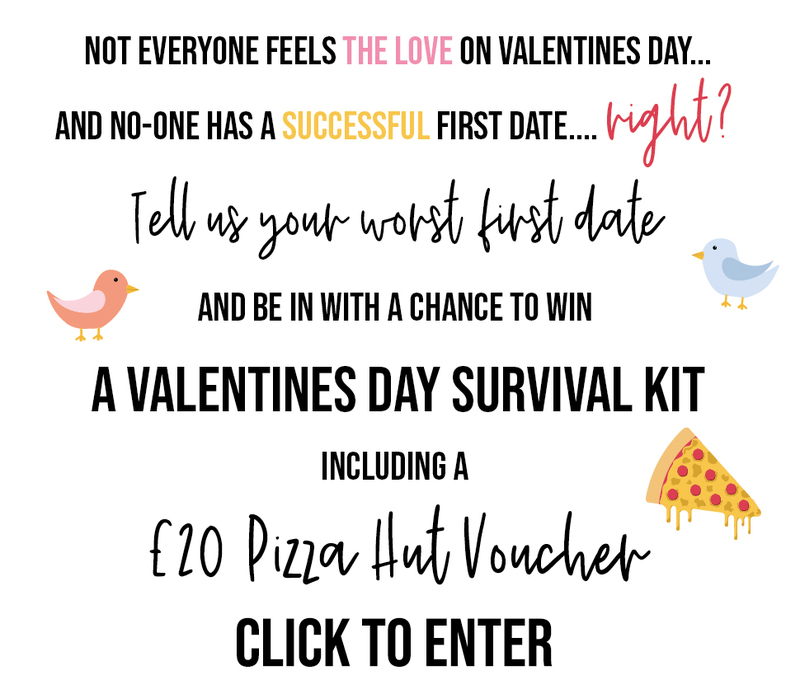 All you need to do is either email us: design@firelabel.co.uk or you can comment on our Facebook post by clicking here with your WORST FIRST DATE STORY to be in with a chance of winning! The competition will begin on 5th February 2019 at 09:00. Closing date for the competition will be: 14th February at 15:00. No further entries permitted after this date/time. Fire Label Merchandising Ltd cannot accept responsibility for entries/orders not received for whatever reason. a. Comment on the Facebook post explaining your worst first date to be entered into the draw. b. The draw will be completed by a member of our team at 15:30 on Thursday 14th February. c. The winner will be announced through Social Media at 16:30 on Thursday 14th February. regulation or any other event outside of the promoter’s control. Any changes to the competition will be notified to entrants as soon as possible by the promoter. prize with another of equivalent value without giving notice. The winner will be notified by email and/or Social Media on Thursday 14th February from 16:00 If the winner cannot be contacted or does not claim the prize within 14 days of notification, we reserve the right to withdraw the prize from the winner and pick a replacement winner. The promoter will notify the winner when the prize is to be delivered. Delivery should be within 2 working days of first contact with the winner to determine size requirement and will be shipped to the winner’s usual delivery address. The winner agrees to the use of his/her name and image in any publicity material. Any requested personal data relating to the winner such as address, telephone number and email will be used solely for this competition and in accordance with current UK data protection legislation (GDPR), and will NOT be disclosed to any third party.